Skechers Lawsuits Contend That Skechers Shape-Ups Toning Shoes Cause, Torn Ligaments Hip, Back, And Ankle Injuries And Other Serious Injuries. If you have been injured by Skechers Shape-Ups or Toning Shoes, Contact Wright & Schulte LLC at 800-399-0795 or visit yourlegalhelp.com for a FREE Skechers lawsuit consultation. The firm is currently representing hundreds of plaintiffs in Skechers Shape-Up Lawsuits currently filed in MDL2308, which is separate from the Missouri filing, and continues to speak with men and women across the country who believe they have been injured due to wearing Skechers Toning Shoes. 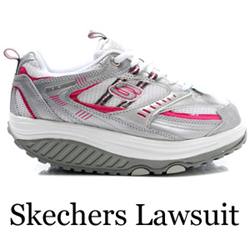 Wright & Schule LLC offers free legal consultations to purported victims of Skechers. You can speak with one of the firms product liability attorneys by calling 1-800-399-0795 or visit http://www.yourlegalhelp.com for information on Skechers lawsuits and other product liability lawsuits the firm is currently handling. The 420 Skechers complaints also contend that the purportedly defectively designed Shape-ups toning shoes with the rocker bottom suddenly pronate inward and causes the plaintiffs’ ankles to collapse, and the plaintiffs to fall down as a result. According to the Skechers lawsuits, some plaintiffs needed surgery to repair the injuries allegedly caused by their Skechers toning shoes. “The people involved in these cases have suffered a multitude of different injuries. Skechers knew or should have known about the risks of serious bodily harm associated with its Shape-up toning shoes,” says Wright & Schulte LLC, which continues to fight large corporations on behalf of men and women across the country who have been injured by defective or unsafe products. “As a result of Skechers failing to provide adequate warning to the public about its toning shoes, consumers have suffered physical pain and incurred – and continue to incur – significant medical expenses.” Richard W. Schulte, a founding partner with Wright & Schulte LLC, serves on the Plaintiffs’ Steering Committee for the federal product liability litigation. Wright & Schulte LLC, a personal injury firm, is dedicated to the belief that America’s legal system should work for the people. Every day, the attorneys of Wright & Schulte LLC stand up for the rights of people who have been injured or wronged, and fight tirelessly to ensure that even the world’s most powerful corporations take responsibility for their actions. If you’re looking for a law firm that will guarantee the aggressive and personal representation you deserve, please do not hesitate to contact Wright & Schulte LLC today. Free Skechers Shape-ups case evaluations are available through yourlegalhelp.com, or call 1-800-399-0795.